Antibiotic resistance is a major and worsening problem confronting healthcare providers and patients today. We have seen an increase in drug-resistant organisms across the country coupled with a decrease in new antimicrobials on the market, so it is imperative that we protect the agents we have currently available by judicious antimicrobial management. Antimicrobial Stewardship has been shown to improve patient outcomes by judicious antimicrobial management. 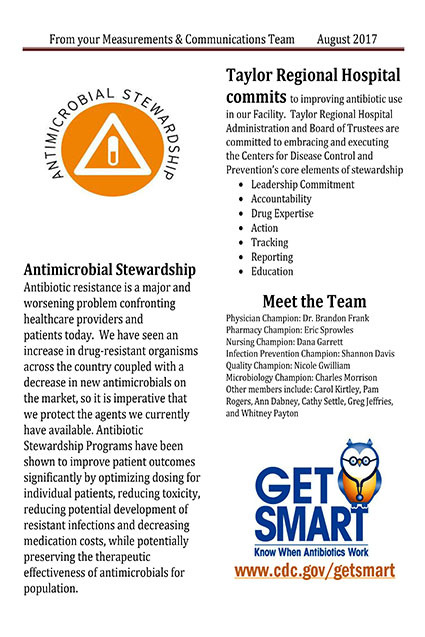 Additionally, Antimicrobial Stewardship has been shown to improve patient outcomes significantly by optimizing dosing for individual patients, reducing toxicity, reducing potential development of resistant infections, and decreasing medication costs, while potentially preserving the therapeutic effectiveness of antimicrobials for populations. practitioner champion, a nurse champion, an infection prevention champion, and a pharmacist champion working in collaboration as appropriate by facility resources and/or structure. Our new website provides many sources for health information and programming. As you can see this is something that will be very useful to our patients, their families and those who may want to know what kinds of services or facilities we have. There are also many other features we hope you will explore. You can look up medications in the drug search, find interesting health information or ask the FastNurse Research Correspondent a question and get a reply to your own personal question. This is a valuable resource and we hope that you will take full advantage of it.